If there’s one thing the people of Munich enjoy, it’s partying and any old excuse to throw one will do. That includes having a festival to celebrate each season, and as many as possible in between. And typically, this involves lots of beer drinking (see the Starkbierfest). Munich is celebrating its 49th Frühlingsfest (spring festival, April 16 – May 2) this year on the famous Theresienwiese, the home of the Oktoberfest. The Munich Spring Festival is sometimes called the “Kleine Wiesn” (Little Oktoberfest) or the “Kleine Schwester des Oktoberfestes” (Oktoberfest’s Little Sister). 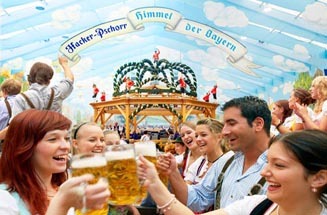 The Spring Festival has a big beer tent called the Festhalle Bayernland which seats about 2000 people. Munich’s favourite Augustiner beer is splashed out from traditional wooden kegs. The festival kicks off with a big parade and Böllerschützen, where aging artillery enthusiasts shoot mini hand-cannons into the air. The first keg is tapped inside the Hippodrom-Festzelt at 4pm on the opening day to get the beer flowing. There are dozens of rides including a Ferris wheel (Riesenrad) a ghost train (Geisterbahn), the Frisbee and Europe’s longest portable slide, the Münchner Rutschn. There are more than 10 rides designed especially for younger kids. Tuesdays are special “family days” with reduced prices for the rides. In 2010 the Hippodrom-Festzelt, a favourite Oktoberfest beer tent, made its debut at the Munich Spring Festival and a new lager beer called Spaten Frühlingsfest Hell was served for the first time. If the weather’s friendly you might want to sit a while in the Radlingers Weißbiergarten, a beer garden that specialises in Paulaner Weizen (Bavarian “white beer”). A band often cranks out old-time Bavarian hits. There’s also a covered section, the Allwetter-Biergarten, if it’s too wet or chilly. On the first Saturday of the festival you’ll find one of Munich’s greatest flea-markets: Over 1000 stands peddling everything from boomerangs to Beethoven. Vendors open at 6am so you’ll need an early start to snap up the best bargains. On the second Friday there’s usually a big fireworks display after sunset. Other special events that pop up sporadically at the fest included a vintage car exhibition and a couple of days where visitors can pay with (now extinct) Deutschmarks. Munich with its air of polished prosperity is quintessential Germany. The old and the new co-exist here with cherished traditions like Oktoberfest, the world’s largest beer festival, rubbing shoulders with designer shopping, sleek cars and high-powered industry. Indeed Munich today is the flavour of the month. The Bavarian capital on the Isar river has strong roots in the past. Its Baroque and Rococo architecture, lush parks, museums and historic venues such as Schloss Nymphenburg, the summer palace of the rulers of Bavaria, are the favoured haunts of tourists and locals alike. This gracious German city is just an hour’s drive from the snow-crusted Alps that frame it so beautifully and lend it an air of enchantment.